Looking Back At GROUNDHOG DAY! | Warped Factor - Words in the Key of Geek. Looking Back At GROUNDHOG DAY! Okay, campers, rise and shine, and don't forget your booties 'cause it's cooooold out there today, says Tony Fyler. Whenever people ask me what my favourite movie is, my first thought is ‘Well…what sort of mood am I in?’ I’m not sure people have just one favourite movie, any more than they have one all time favourite song, and, with over twenty years of geekdom under my belt, you know I have lists – top five, ten and twenty overall movies, comedies, thrillers, dramas, horrors etc. 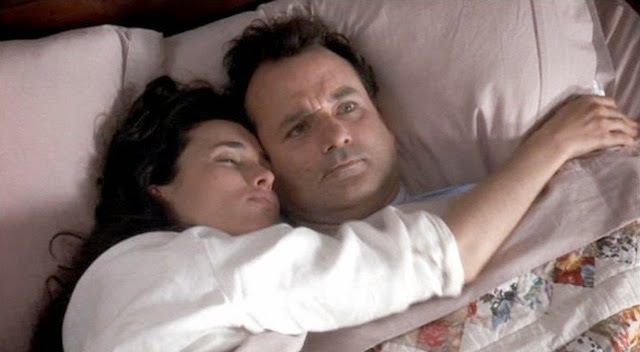 But whenever people ask – and we’re geeks, you know it happens more often than people would imagine – the first name that springs to mind, the film I’d be happiest to be stranded on a DVD-playing desert island with, is Groundhog Day. Seriously, Groundhog Day? 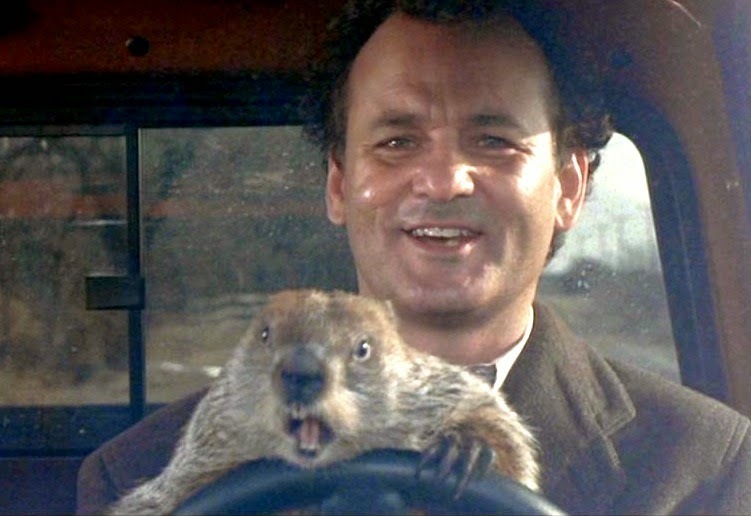 Not Citizen Kane, not Gone With The Wind, not Life is Beautiful, but…Groundhog Day? Yep, seriously. 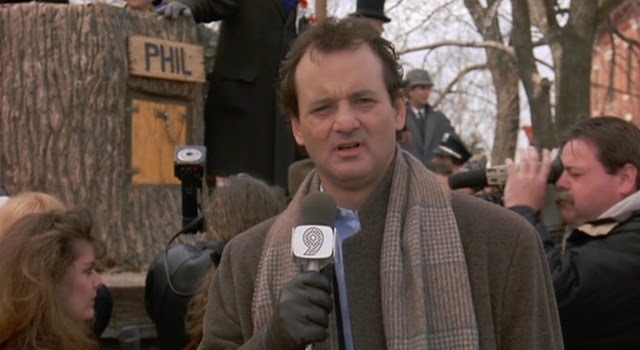 Groundhog Day is a movie that comes close to perfection to me for so many reasons. Let me walk you through them – and pay attention, or you might wake up tomorrow to find you have to walk through them with me all over again. First and foremost, the wonder of Groundhog Day is in the writing. Danny Rubin and Harold Ramis manage to slam A Christmas Carol and It’s A Wonderful Life together, relocate them away from the overcrowded Christmas movie market, and produce something both nuanced and beautiful. Phil Connors, weatherman, is a person beaten down by life and pumped up by ego, resulting not in an especially evil human being, but one who sees the best in nothing and the worst in everything, most especially everything in his self-important life. The annual Groundhog Day ceremony in Punxsutawney confronts Phil with the fundamental pointlessness of his job – when more people believe a rodent’s prognostications than yours, you have to wonder why you keep on breathing, and you’re likely to develop a more-than-healthy loathing for human beings and groundhogs alike. With a career as pointless as that, no-one to love him, and a growing cloud of gloom and despondency likely to keep his trajectory heading downward, Phil is a man with just a little rope left, and only his ego to keep him attached to it. The pace at which the reality of his situation unfolds for him is expertly pitched – the first time yesterday happens today, he goes along with it in something of a daze, as you would. The second time, it’s a testing experience, to ensure he’s not going entirely mad, and from there on, what Groundhog Day is is an exploration in the ways of coping with life that people have. Phil’s innate first reaction is flippancy – if today has no consequences, then eat, drink, be as merry as you can (hence conning Punxsutawney Nancy into bed). Then comes the despair, and the translation of It’s A Wonderful Life’s central conceit – a man at the end of his rope, determined to commit suicide – into a wonderful, inventive series of attempts to kill himself, day after day, which merely leave him trapped at the beginning again, hating the life he cannot escape. He’s rescued from this despair by the notion, if not at first the reality, of love. He falls for Rita, his producer, and at first the pursuit of her is a glorious distraction, a way of passing the endless day that won’t move on – the endless Groundhog Day, and he even figures that if there’s any reasoning intelligence behind his entrapment in an eternity of Groundhog Days, then maybe falling in love with someone, and getting them to fall in love with him too, might be a way of breaking the hellish deadlock on his life. But he approaches loving her as a project, as an assignment, as a Thing To Do, and it always, always fails. He comes close, but still fails. But the process in itself has a healing effect on Phil. If making someone else like him can make his endless Groundhog day feel as good as it does when he woos her, he reasons, perhaps what he’s been given is not a curse after all, but an opportunity to learn, to grow, to find out about other people and get outside his own narrow bandwidth of existence. So begins the remaking of Phil Connors. He learns the town. Learns its people, learns its routines, learns when bank trucks are backed up full of cash, learn when young boys are due to be falling out of trees and old men are going to be choking on steaks, and learns when an old hobo is due to die, unloved and unwarmed by human kindness on the cold, cold streets of Punxsutawney. In a beautiful inversion of It’s A Wonderful Life, Phil begins to use his endless day as a way to become the Guardian Angel to the whole town, always there with a Heimlich Manoeuvre or a jack when people need it, and learning to love the town and its people on their own terms. Whether he knows it or not, he’s living a more Rita life – he himself says of her she’s ‘kinder to strangers than anyone else I know’ – and by becoming more like her, he’s drawn more and more into a real appreciation both of her, and of life itself in all its shades. Even though he continually fails to save the hobo, he never stops trying, he never gives up on him, taking responsibility for even the strangers no-one else wants to know. When told that it was ‘just his time’ to die, his response is telling. ‘Not today,’ he says, as though today is his own personal bailiwick. The message, essentially is clear – today IS our bailiwick, to determine how we live, what we care about, whose lives we touch and how – with brusqueness and discourtesy, or by going out of our way to smooth their path. Finally, it’s this Phil Connors that Rita sees, and when she begins to flirt with him, Phil at first doesn’t notice, taking a raincheck because he has errands to run. It’s this Phil that Rita buys at the charity man auction, and it’s this Phil, the Phil who has learned to walk in other people’s shoes and feel the impact he can have in his world every day, this Phil who is able to tell Rita the truth about his endless daily life, with whom Rita chooses to stay. 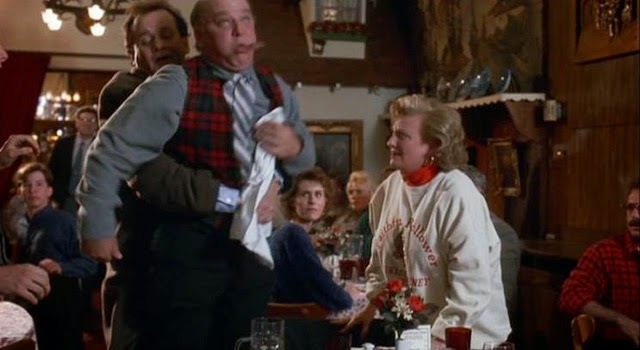 It’s this Phil who deserves Rita to stay, and this Phil who, as the movie ends, has given up his embittered careerism, and simply wants to move to Punxsutawney, with Rita, and live happily ever after. It’s a modern fairy tale, but with plenty of gags along the way, be they sight gags, character gags, dark gags, philosophical gags (“Yeah, what if there is no tomorrow? There wasn’t one today.”), or rom-com gags about the lengths to which men will go to get women to fall for them. It’s the full package. Groundhog Day not only has all this in the writing, it has arguably the best directing of Harold Ramis’ career, keeping the storytelling tight and covering a lot of ground lightly and with an assured touch. It has Bill Murray in arguably his last stand-out funny lead role before meeting Wes Anderson and going in what might be called the more self-consciously artistic, realistic, downbeat direction in which he has also excelled. The plethora of other character-roles are well filled and rounded, an absolute necessity to sell the idea of Phil falling in love with the town and its people, and the direction also allows many of them their moment in the spotlight, even if the moment is repeated day after day after day. Granted, it does have Andi McDowall, at that point in her career when someone told her that romantic comedies were a thing she could do, and during which period she made a number of movies slightly less good than they could otherwise have been, but the fact remains that even with the McDowell effect, Groundhog Day shines brightly no matter which direction you approach it from – as a comedy, as a philosophical treatise on effective living, as an inversion of It’s A Wonderful Life, or a Christmas Carol-style story of mid-life direction change to deliver a better world. 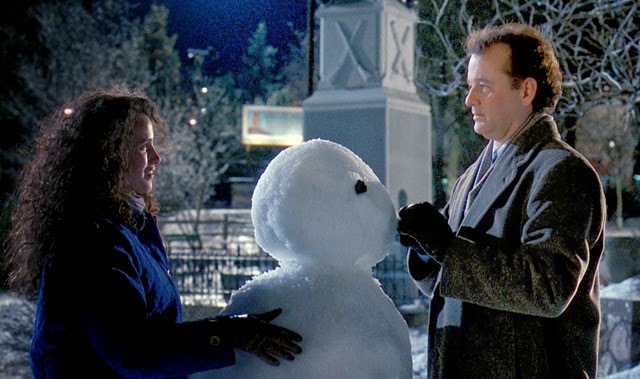 It’s simply as perfect as any McDowell movie of the period could be, and 25 years on, Groundhog Day stands as 101 minutes of soul-balming, life-enhancing joy. With the perversity of an excellent movie about repeated experience, it remains a move that rewards the viewer time and time and time again.